We held a beautiful event in Malhalmdale in North Yorkshire recently with our partners at Carnegie Great Outdoors delivering a “taster” day at the welcome surroundings of Newfield Hall. The session attracted a number of training and HR professionals to introduce them to experiential learning with an outdoor focus and how to facilitate it. Outdoor activity can be a highly effective way of developing people and teams but it often suffers from the “what now?” effect as participants struggle to contextualize their experience, establish relevance with the work place and commit themselves to action. It’s often classified as “Team Building” days too, which can be a turn off for many. We have worked with Carnegie for a number of years now and I’m always amazed at the transformation we see when people are introduced to new challenges and experiences (some of them a little airy) but also in providing them time and space to reflect and personalise their learning. We think we have the right blend now to make sure these are fantastic learning days as well as being a great day out and we arrange our days and activities around the needs of our clients. If you want to develop leaders, develop strategy, help people to communicate more effectively or just have a great day out with some new insights then make sure you work with people who can bring the best out in your people. It will reap rewards back in the business. We are delighted to be able to offer this as part of our existing portfolio and we can even arrange some fantastic venues around the UK like Newfield Hall as a refreshing (and cost effective) change from boring old hotels. Finally, you don’t have to throw yourself off a cliff as seen in the picture, we believe in “challenge by choice” which means people going at their own pace and level of challenge. I hope this gives you some thoughts or ideas if you are planning developmental events and I would be delighted to talk to anyone considering any sort of event off site. 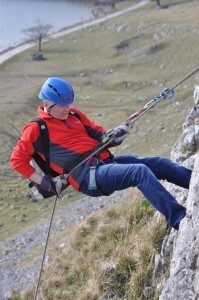 PS That is me by the way, I hate heights but love abseiling and have learned a lot about myself by doing it.